Here is another writing prompt that I found online. "How does your main character react to the idea of romance?" I'm taking the main character, Alexander Williams from one of my novels in progress called Twins (and to an extension, The God Sword which is the sequel to Twins). Alex lay back on the roof of his house as he stared up at the clouds moving across the sky during the sunset. He patted his stomach after he ate dinner as he stuffed himself way too much with the food that his mom prepared for the meal. "Are you up here, Alex?" He heard his older sister, Risa, called for him from the room below him. "On the roof, Sis." Alex replied back as he sat up to see his older sister climb up onto the rooftop to watch the clouds with him. I watched the Japanese drama called Love Song recently. It aired during the Spring 2016 season from April 11 to June 13. It stars Fujiwara Sakura and Fukuyama Masaharu. The premise of the series is that Kamishiro Kohei (Fukuyama Masaharu) used to be a professional musician for his band, and had a one-hit wonder before his contract expired and no one wanted to sign him. He retired from being a musician and works as a counselor for the hospital and a company. Then comes in Sano Sakura (Fujiwara Sakura) into his office for counseling due to her poor communication with her co-workers and her boss. He finds out that she's a stutterer and lived a lonely life while growing up. However, when she sings, her stuttering goes away and she's blessed with a beautiful voice surprising her co-workers, Kohei, and her best friend. Kohei hopes to give Sakura hope and inspiration in life. That's the gist of the story line without giving away anymore spoilers. 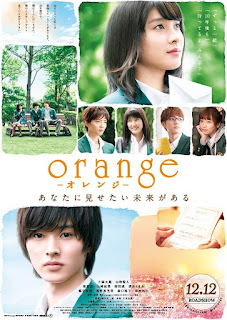 I recently watched a Japanese movie called Orange that was released December 2015. It starred Tao Tsuchiya and Kento Yamazaki with co-stars Ryo Ryusei, Hirona Yamazaki, Dori Sakurada, and Kurumi Shimizu. The movie is adapted from the manga of the same name by the mangaka, Ichigo Takano. The overall plot of the story is Naho Takemiya (Tao Tsuchiya) receives a letter from herself that was written 10 years into the future that details her school life of that year in hopes of erasing any regrets that she felt during that time in her life. One of her friends, Kakeru Naruse (Kento Yamazaki) passes away a year later and she hopes that her letter arrives in the past in time for her past self to change the future and save Kakeru's life. That's the premise of the movie without revealing anymore details about the story.